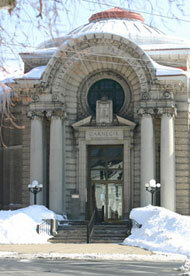 Our library building was erected with funds provided by Andrew Carnegie. 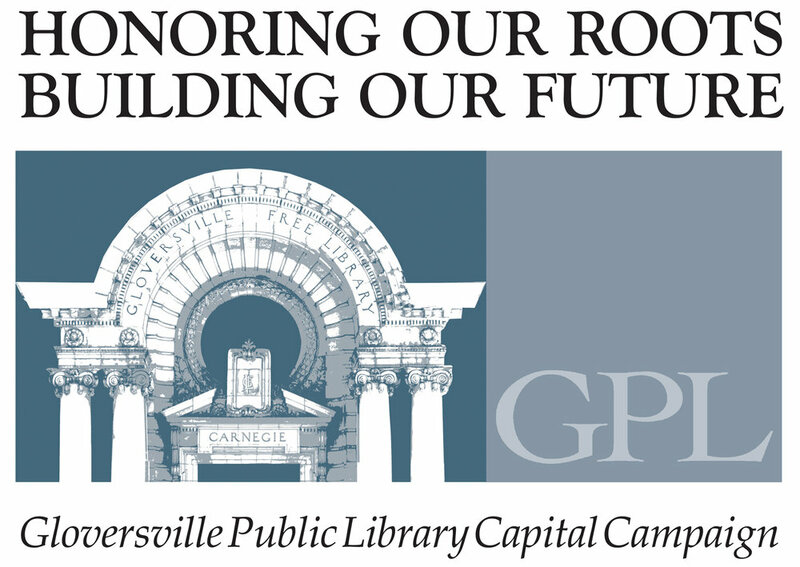 Mr. Carnegie’s grant was given largely due to his personal friendship with Dr. Peck, and on the condition that the City of Gloversville continue to support the library financially. The cornerstone was laid on August 27, 1904. Albert Randolph Ross, an architect with the New York firm of McKim, Mead and White, designed this masterpiece of Beaux Arts style, which, since 1976, has been listed in the National Register of Historic Places. When the library was first built, it literally gleamed, being constructed of a soft creamy colored limestone base and top and a slightly darker tan brick. It was Gloversville’s new library and it represented a beacon of self-education and opportunity to the population of Gloversville, many who had recently arrived here from the “old country.” The dirt and grime from a century of wood, coal and oil burning furnaces and traffic on busy Fulton Street had turned the library into what many people thought was a grey stone building. The project to restore the library’s façade began in the fall of 2010 with the Friends’ Celebration fundraiser. The restoration project needed to include a thorough cleaning since cracks and other damage could be hidden behind the grime. A grant from New York State’s Division of Library Development was awarded in 2011, with the Friends’ donation as the required match, completing the funds needed to do the work. The project was publicly bid in October of 2011 and four contractors submitted proposals. The firm of AJS Masonry, Inc., experienced in the restoration and cleaning of historic buildings, was the winning bidder in the competitive process and was awarded the project. As the project proceeded, the building was inspected for cracks and damage that may have occurred over the century. Mortar is important to the integrity of the entire building, and there were many places where the mortar had either disappeared as the result of weathering, or where the pointing had been done with mortar that was incompatible with the original product. Thanks to a special grant from Senator Farley, we are able to re-point the entire building. The inspections that were completed as the project moved forward have reassured the library board that the building is strong and secure! We can continue to provide another century of library service in our beautiful building. Click through the slideshow here. The most recent and final break out project before a full renovation was the replacement of 14 of the 16 arched windows that wrap around the building. The original 1904 windows were replaced in the 1970's. The new 2014 windows are more energy efficient and are more reminiscent of the originals. Two of the windows were not replaced because they will be impacted by the full renovation beginning in late 2016.